Within MusicBrainz it is possible to link an artist to the equivalent Discogs artist, in fact there are already some 300,000 artists linked. However there are nearly a million artists within MusicBrainz leaving nearly 700,000 artists unlinked, the majority of these already existing in Discogs. 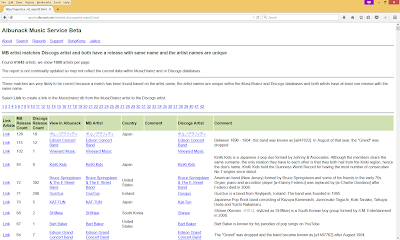 Linking both artists together allow information between the two databases to be shared, for example the Discogs artist may contain the real name of the artist and that might be missing from the equivalent MusicBrainz artist aliases. Alternatively MusicBrainz may have various translations of an artists names for different languages, and these variations may not be available in Discogs. Simplified MusicBrainz artist is unique within MusicBrainz list of artists. Smplified Discogs artist name is unique within Discogs link of artists. Because of these conditions we are confident there are very few (if any at all) bad links. The simplified artist names remove case, accents and some punctuation in order to allow matches between artist names that are not identical. 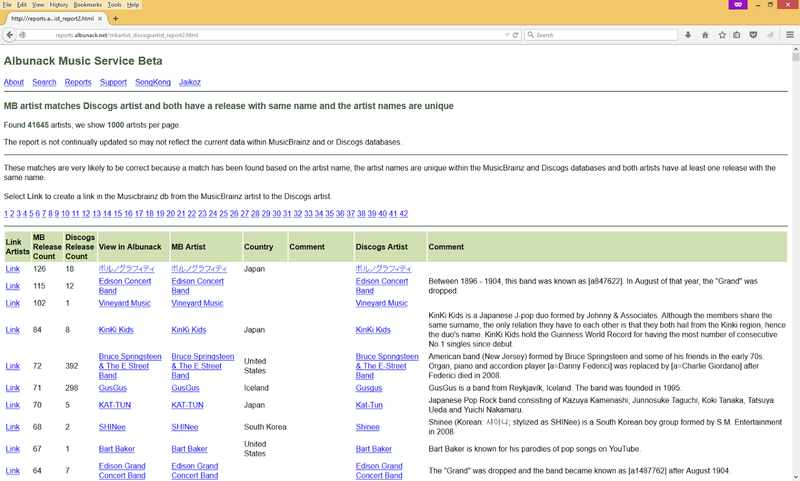 Because we only include artists whose simplified name is unique within the databases it is unlikely that the MusicBrainz artist has linked to the wrong Discogs artist. And this is made very unlikely with the last condition that requires both artists to have a release with the same name. Some of the links may already have already been created because the underlying database is not updated in real time, but it is regularly updated - usually every week. Links are listed so that artists with the most releases are listed first, the basis being that these are likely to be of most interest. But with 40,000 artists to link the job to complete this task could take some time, so if you have 10 minutes please consider double-checking and then creating some of these links within MusicBrainz.